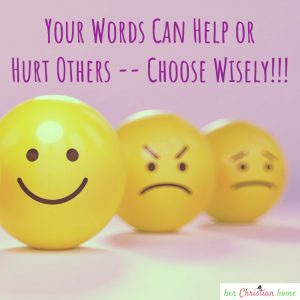 Your Words Can Help or Hurt Others — Choose Wisely!!! Ever since I was born, words have had both a positive and a negative influence on my life. And it is the same for you and for every human being who has lived here on earth. Negative words can be the hardest to bear. Sometimes we need some good criticism to set us back on the right path. It was once told to me to listen well to criticism. If there’s truth to it, and it’s something that I need to change, then criticism can become a welcomed gift. However, some criticism isn’t intended to be a blessing. It’s meant to simply tear us down and destroy our joy. If this is the case, then we need to put this criticism where we put our trash. End of story. But, no matter how much we try to believe the ole’ story that “sticks and stones may break our bone but words will never hurt us”, harsh words still have a vast affect on us mentally and emotionally. 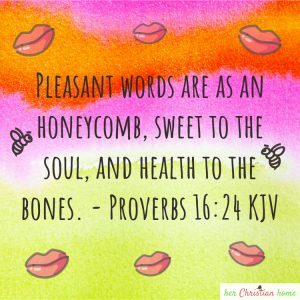 If you read and study God’s Word, you’ll see plenty of Bible verses referring to spoken words. Why would God mention the use our words if it were not important in how we use them? From the very beginning God spoke words to create our beautiful earth, the sun, the moon, plants, animals, man and woman. Genesis 1:3 KJV says, “And God said, Let there be light: and there was light.” >> “And God said… ” is mentioned several times in the process of His beautiful creation. God’s Words were used for good. From the very beginning, words have been used to communicate that which is hidden from within our heart. When Cain made the defiant remark, “Am I my brother’s keeper?” we can see the rebellion seeping out from his heart. Today; however, I don’t wish to focus on negative words. Rather, my purpose is to challenge you to use your words to be an encouragement to others. Whose life might you have a great impact on because you took time to encourage them with your words? Who might be influenced to seek and know God because you shared loving words? What child might rise above some rough challenges because you paid them a nice compliment? What friend might be encouraged through your words to help them through a dreadful trial? What Christian brother or sister in Christ might stay faithful coming to church because your words have shown encouragement and shown love to him/her. > Will you pray today that your words can be a blessing to others? > Would you let God use your words as a tool to glorify Him? This has really helped me thanks. Some of the guys who are brothers (biologically and in Christ) have been fighting quite often. This has really helped just as the negative thoughts one has. I have been afraid the younger brother would end up having anger issues. I will show him this tomorrow. Praying for a miracle. God Bless. May God bless you, Hannah. I know there’s so many who do struggle with anger issues. I hope and pray for that miracle that’s needed!